The Boston & Maines Flying Yankee streamlined train set is being restored by the Flying Yankee Restoration Group. Visit them at www.flyingyankee.com for more info. Also B&M 3713 is being restored at Steamtown National Historic Site. Boston & Maine Railroads No. 3713 steam locomotive that is being restored at Steamtown National Historic Site in Scranton Pennsylvania. So authentic you just might feel her rumble. 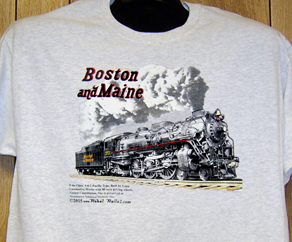 NEW t-shirt with the Boston & Maine Railroads Minute Man logo on a light grey/ash premium tee shirt. 6 inch x 6 inch square tin logo sign of the Boston & Maine Railroad, the road of Minute Man Service. 6 inch x 6 inch square tin sign of the Boston & Maine Railroads The Minute Man drumhead used on its passenger trains. 6 inch x 6 inch square tin sign of the Boston & Maine Railroads last logo. 6 inch x 6 inch square tin sign of the Boston & Maine Railroads steam era logo used on many of its steam locomotives. The beautiful Boston & Maine Railroads Flying Yankee streamlined train set. The Flying Yankee is currently being restored. Coffee Mug featuring two of the B&M Railroads logos superimposed over the paint scheme of its diesel locomotive. A very unique way to present the railroads logo. Boston and Maine 3713 is being restored at Steamtown National Historic Site. She was named The Constitution. License Plate Boston & Main logo. Classic Minute Man logo used by the Boston & Maine Railroad for many years on just about all of its equipment. 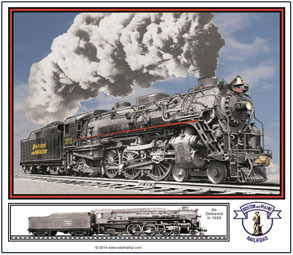 Mouse pad featuring the Boston & Maine Railroads famous 3713 passenger steam locomotive. She is being restored at Steamtown National Historic Site in Scranton PA. Official name was The Constitution. 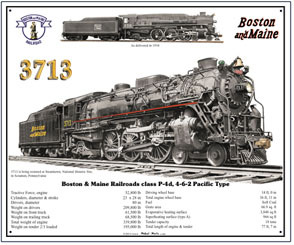 Boston & Maine steam No. 3713 is currently being restored at Steamtown National Historic Site. This unique and informative 10x12in sign contains builders specifications with logos and official builders photo from the Lima Locomotive Works.